Parents of soldier convicted for shooting wounded terrorist disrupt speech by former Defense Minister, confront him over treatment of son. The family of Elor Azariya arrived at a synagogue in Givat Shmuel where former Defense Minister Moshe Ya'alon spoke Thursday night and confronted him. 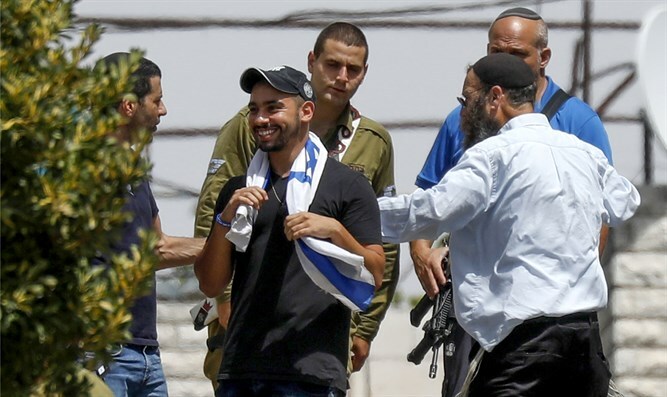 According to News 2, Azariya's parents argued with him for several minutes about the facts of the shooting death of a terrorist in Hevron for which their son was sent to prison. "How could you lie and say that after the investigation my son acted excessively? How could you abandon an outstanding soldier?" his mother, Oshra Azariya, asked. Ya'alon refused to answer the question. "There are many lies in this incident, but they are not the lies that you mentioned." Azariya's parents continued to press him. "How did you go out to the media at 4:00 PM when my son was first interrogated at 6:30 PM? There was no investigation yet, and I have been waiting for an answer from you for two and a half years." Ya'alon tried to answer, "This is one of the things that was used politically, cynically, on your back. I know your suffering, I also called you after the verdict was made." "Even the judge said that it was still operational, he was still in the operational arena. I told you something that you did not even bother to check - after the shooting my son was with his weapon for 4 hours. He was guarding the witnesses in Hevron. You're just trying to market yourself," Oshra said. Azariya's father joined the confrontation and told the former defense minister that "I want to know why you continue to slander the name of my son and my family. The education my son received is not the same education that you gave to your children, because all of my children have served in the IDF and I have given 33 years to the State." Oshra Azariya did not allow Ya'alon to respond: "How did you know? Were you there?" Eventually, Ya'alon asked in response if is she was there at the time of the incident. At this stage, the family was asked to stop the confrontation and allow the former minister to continue his speech.